In Evansville, Indiana just down the road, there’s an energy company called Vectren Corporation. Vectren’s rates are up 62.8 percent, or $59.85 for that amount of electricity, over the last five years. They’re up 109 percent, or $80.91, over the last decade, said Eric Bradner staff writer for the Evansville Courier & Press. 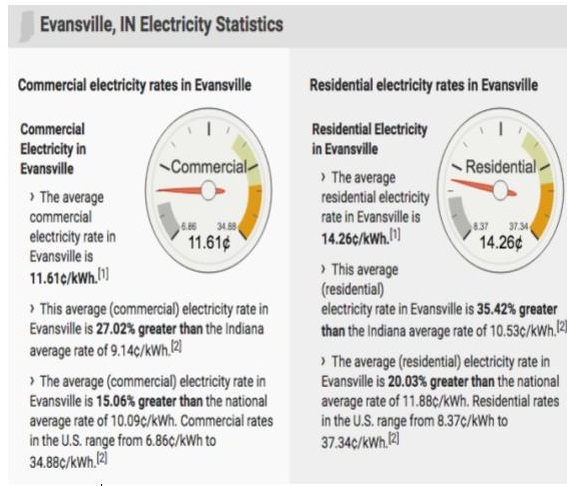 “In these economic times, it is unthinkable for Indiana ratepayers to shoulder the burden of higher utility rates solely for the profit of monopoly utilities when cleaner, cheaper alternatives exist.” (“taxpayer-friendly alternatives”). I personally remember as a kid changing the thermostat a few degrees could financially set families back. This corporation, like many others in the U.S., has held its community hostage for many years. Vectren Corporation energy rates are one of the highest in the nation, according to data from the U.S. Energy Information Administration.